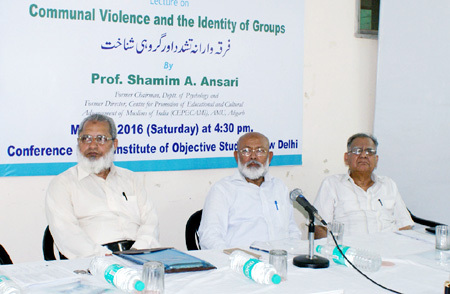 A lecture on “Communal Violence and the Identity of Groups” was organised by the Institute of Objective Studies at its Conference hall on May 21, 2016. 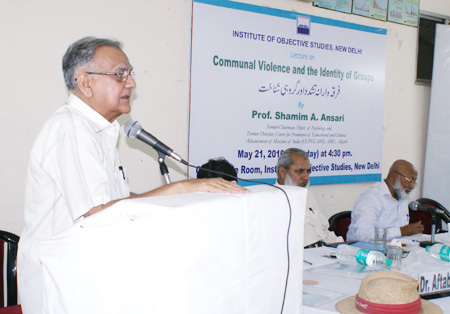 Delivering the lecture, Prof. Shamim A. Ansari, Professor of Psychology at Aligarh Muslim University, observed that communal violence was one of the most vulnerable conditions that not only widened the gap among the groups, but was also detrimental to nation’s growth and development. This was the tragedy of the Indian sub-continent that no one realised the cost of communal violence in terms of men, material and economic resources, he said. Emphasising the need for controlling communal violence for the sake of nation-building, he said that the identification of reasons for such a national social evil was very important. In this connection, he cited identity crises as the most important reason adding that it weakened one’s psycho-social make-up so far as the perception about oneself and others was concerned. 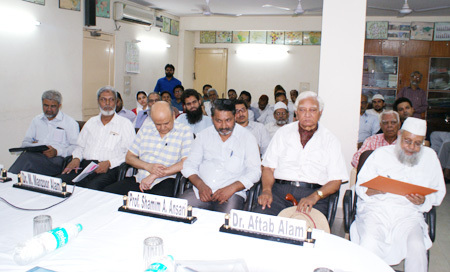 Prof. Ansari held that post-Independence scenario witnessed frequent occurrence of communal tensions, usually turning into communal violence in which lives of innocent people and properties were lost. Such ugly, shameful and inhuman riots not only posed threat to psycho-physiological well-being, but also became instrumental in weakening inter-community relations and national integration, he noted. He explained that factors like, personal identity, social identity, prejudice, social alienation in the form of socio-economic and educational deprivation, reservation of Muslims, chauvinism of the majority community in the form of self-righteousness and perceived cultural superiority contributed to the eruption of communal violence. Besides, identities of the groups were responsible for cultivating communal tension and disharmony which subsequently turned into communal violence. Thus the genesis of a group’s identity was important in analysing the reason for communal violence, he insisted. He also said that there had been several reasons for group identity crisis that might be seen in the light of historical perspective of groups residing in a particular society and the nation at large. 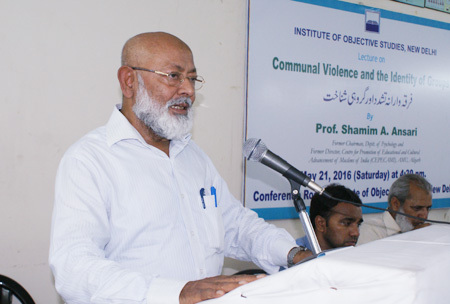 Tracing violence to the killing by Qabil of his brother, Habil, both sons of prophet Adam, Prof. Shamim said that violence was an old instinct in the human being. Partition of India was a turning point in Indian history as the exchange of population between the two countries led to the killings of thousands of people belonging to both the communities. The partition brought in its wake large-scale destruction of property and loss of human life. The first Prime Minister Pandit Jawaharlal Nehru had asked Gardener Murphy from the UNESCO to study the causes that led to communal violence after partition. He went into the causes and came out with a book titled In the Minds of Men. He said that the identity of a community was instrumental in communal violence. Identity crisis was the source of communal violence. According to him, sometimes, the feeling of insecurity in the majority community and need to protect itself caused communal violence. Categorisation of people as good and bad at home grew deep among children who took another lesson from the school teacher. The teacher who taught his students from school textbooks that glorified one national hero and showed the other in poor light. This called for resource material in textbooks to be value-based and positive in approach, so that students learnt lessons of brotherhood and communal harmony and respect for all religions. Prof. Ansari pointed out that the sense of belonging to the nation too had a role to play in certain situations. He proved his point by saying that the output in private sector was bigger than that of the public sector. This was due to the pressure on the workers to work maximally for the greater profit of the company. But no such thing happened in the public sector which incurred heavy losses due to non-performance of its workers. This showed the need for full utilisation of human resource. As the saying went, “An empty mind is the devil’s nest”, one must achieve efficiency suited to the job. He said that despite the use of state-of-the art technology in automation where the size of the workforce had gone down considerably men were still in a commanding position. Stressing the need for proper planning, he said that optimal utilisation of human resource must be made. Holding that education and employment were co-related, he opined that the deprived must get an opportunity to develop. Owing to the presence of the holy Quran and Hadith, Muslims had a strong identity. Their teachings made the Muslims not to be fearful of death which was not found in any other religion. While lamenting that the media had failed to play an important role in creating an atmosphere conducive to peace and harmony, he said that the government, too, was found failing in its duty to promote brotherhood, communal and social harmony. 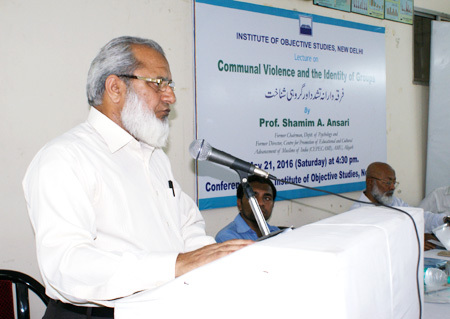 The Secretary General, IOS, Prof. ZM Khan held that the communal violence was multi-dimensional. It could be studied from the angle of psychology, politics and sociology. Several scholars had studied the subject and drawn their conclusions. With the advancement of science and technology, the reach of social media was not bound by country or continent. Messages of various sorts on the facebook were scanned, studied and then spread across the globe. Islamophobia was such a falsehood that gripped the world today, he said. He felt satisfaction that India was still safe from the scale of strife that was being witnessed in Syria and other countries of the Muslim world. Chairman, IOS, Dr. Mohammad Manzoor Alam in his presidential remarks announced that the IOS would hold a national dialogue programme in the first week of September in which representatives from major religions would be invited to deliberate on communal harmony. He said that the pattern of communal violence had changed between 1947 and 1997. An effort was made to put an effective curb on communal violence by bringing the Anti-Communal Violence Bill in Parliament, but the stiff resistance put up by the then main opposition party and the complicity of members of the BJP stalled the bill. He said that the communal forces in the country used violence as a tool to come to power. They successfully polarised Hindus against Muslims in their bid to attain power. They knew when and how to use a person in their sinister design to spark off communal violence. The rioters took advantage of the fact that the Muslims by nature were uncompromising on their identity. He held that during India’s freedom movement, the RSS had advised Hindus not to waste their energies on it and keep their power reserved for use against Muslims and the Christians when the time came. Calling Islam a religion of peace and well-being of the entire mankind, he noted that the Prophet of Islam (PBUH) freed the maximum number of slaves. Earlier, the lecture was preceded by the recitation of a verse from the Quran by Hafiz Athar Husain. The proceedings of the lecture were conducted by Dr. Aftab Alam, Asstt. Prof., Zakir Hussain College, Delhi University. A large number of scholars, university teachers, social activists and prominent citizens, including Ammama Sabri, Prof. Shafiq Ahmed Khan Nadvi, Kamal Ahmad, Col. (retd.) Abdul Rasool Khan from USA, Dr. Tariq Ashraf, Mushtaq Ahmad Wani, Syed Ahmadullah, Afroz Alam Qasmi, Rashiduzzafar, Abdul Hafiz, Abdul Haq Falahi, Nihal Ahmad, Mohd. Minhaj Ahmad, Shakeelur Rahman, Qamar Ashraf, M. Shamsuddin, Safi Akhtar, Waseem Ahmad Fahmi and Dr. Bismil Aarfi, were present on the occasion.